So there is this neat little invention that allows people to vote on deals at local restaurants, shops and other businesses. Usually, the deal is about 50-60% off of the regular cost of the service/product. 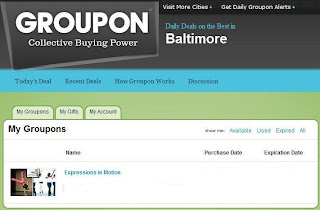 When I saw a groupon for dance classes, I immediately voted on it and subsequently bought it. It is a pretty fascinating and simple concept. I used my first of 5 classes to take tap, a dance form that I was very involved in througout high school and have only dabbled in since. However, even as dabblers, the class was a little lame, and I think the next 4 classes will be reserved for trying things like Capoeira and Yoga. Now I have to admit, that I may have tried this before. In fact, I will put this disclaimer out there that, with any of these projects, there might be a chance that I have done these in the past and have since forgotten. You see I think there are holes in my brains. Out of these holes, random facts, names, memories, and especially numbers escape. I, for example, seemed to have lost the entire memory of having gone whitewater rafting in Alaska. I was so convinced that I never did this that I fought my sister on this topic for quite awhile before she called in reinforcements and had my parents verify this experience. So, if I have forgotten a whole 2+ hour, should-be engaging event, it could very well be that I have also forgotten something small like having tried a bizarrely colored vegetable. For this pocket project, we'll just have to go by intention. As for the purple cauliflower, it tasted the same, yet was intriguing and fun until I saw that the water beneath the steamer had turned a kind of murky blue. Then all of a sudden, I felt like I had eaten a rainbow-dyed carnation. I still don't know for sure if the said vegetable was dyed or just perhaps genetically engineered. Either way, it has turned me off to unnaturally colored legumes. Yes, I'll admit; my new things have been very food-oriented. I have noticed this. I think this points to the fact that I spent 18+ years in the Baltimore county suburbs, and that doesn't allow a ton of room for creativity. I will also admit that this is my own fault and living in suburbia tends to drain my mental juices so that I lose some of my own vigor and interest, but there it is. Today my interesting thing was a bagel. In my defense, last night, I did go salsa dancing at a very flowery and gaudy place called Latin Palace. So though I was led in a very fancy bachata with an older Cuban, danced a ridiculously fast merengue with a nice Ecuadorian and got hit in the head twice on a crazy busy dance floor during a 12 minute long merengue-turned-bachata, this blog is meant to talk about new adventures. And ironically, I wouldn't call this experience exceptionally new. However, after a night of hip shaking, head throbbing, feet aching, latin dancing, sometimes you need a day with only a bagel's worth of excitement. Since I am not in a position at the moment to tour around the actual world, I can do it virtually by lining up little tiles of similar colors, earning me gadgets like binoculars and globes to put in my fake suitcase, and sending me from England to France to Egypt (I think). 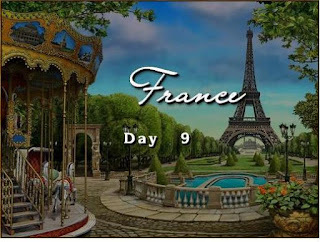 I never got past France. 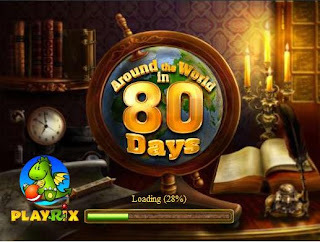 My new thing of the day was the Around the World in 80 Days video game on Yahoo! games. However, since I have never played any game on Yahoo! games, I suppose that was also a new thing. This game seemed right up my alley. This was kind of a fun variation on Tetris, a childhood favorite of mine. However, you will find that the characters are quite gabby, and you have to click through their conversations almost as much as you have to click on the tiles in the game proper. Maybe I will try to get to Egypt tomorrow. After all, it is my mother country. Want to try to beat me around the world? Why? Refer back to this post. I felt like I was back in my years of doing Karate. (yes, I did Karate at one point in my life). This probably would have been a good class to take if I had just been overlooked for a promotion or if I found out that my boyfriend was cheating on me with a friend. I, however, (and luckily) had no such issues and was probably feeling a little too even-keel for this class. 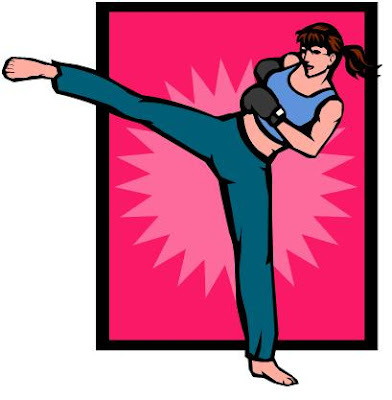 I was more excited about hearing a track from the movie "Cutting Edge" than about the punching and kicking movements. We appropriately went to Ryan's Daughter, an Irish pub in Baltimore, in honor of my sister's birthday. Coincidentally, she was not with us. 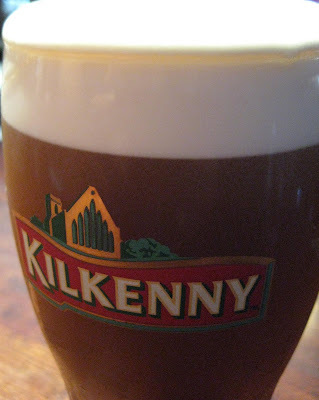 She is actually in Ireland itself, and we just toasted her from across the Atlantic (while I choked back my jealousy). The beer was yummy! I might go toast my sister more often. I have noticed that for the past couple of years January never feels like a fresh start. It always seems to belong to the year before, as kind of the wrap up session. No one gets anything done in December; so January is finishing up those projects that got pushed aside by the holidays. Even New Year’s resolutions don’t really start in January. The resolutions for the year are made, but some prep time is needed to get these things going. January is the prep time. This is especially true for me because my birthday falls at the end of the month. So it is hard to feel like I am beginning a new year when 27 days later, I am celebrating a new year all over again. So a new year that begins in February seems to work best for me. Luckily, this falls in line with the lunar calendar and the Chinese New Year. So this year, I decided to ring in the Chinese New Year (with a western twist), but in camaraderie with my friends around the globe. This is the year of the Tiger in Chinese tradition. And not just any tiger, the white tiger! This is apparently a fairly rare occurrence as it has to fall on a metal year (years ending in -0) and a tiger year (every 12 years). I also thought this was cause for celebration because white tigers have always been my favorite animal. (Although, apparently there is thinking that white tigers are actually a sign of misfortune… I always did see things backwards). Anyway, with all these holidays and with the upcoming lent season, this meant that gluttony was upon us this weekend. Most of my new things involved food, chocolate, drinks, parties or other indulgences. Not a great picture, but a fantastic dish. Pine nuts, mint leaves, feta cheese and shrimp! What a perfect combination. Not sure whose recipe it is, but it is genius. I’d be happy to share it with the curious of you out there. Project 18: 3,2,1... Happy Chinese New Year! Though I doubt this will be the last year that I celebrate Chinese New Year, it was certainly the first. I made noodles and bought tiger masks in honor of the year of the tiger. At midnight, we blew paper horns and popped champagne. 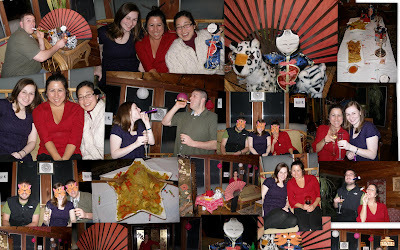 I am not sure that we did justice to the Chinese tradition, but we certainly had fun making our own. Project 19: Being a sap. Making pink heart-shaped pancakes for Valentine's Day breakfast. Normally this type of thing would make me puke. I am not a Valentine’s Day enthusiast. In fact, I have been dubbed the Grinch of Valentine’s Day by at least one of my friends. But in the spirit of a new year, I worked against my gag reflex and decided to celebrate with the Whos in Whoville. Project 20: Coffee Granita- homage to Caffe Eustachio in Rome. I am most proud of this undertaking. I made coffee granita from scratch in my own home. It, of course, cannot touch the granita of Caffe Eustachio or even Tazza d’Oro in the Piazza della Rotonda (Pantheon area). However, it was pretty tasty regardless, certainly surpassing my expectations. I am giving up chocolate for lent. This is hard for me. I have done this in years past and I remember the agony, because as many girls know, when you have a craving for chocolate, nothing except chocolate quite satisfies it. I am also quite strict about the whole thing and I give up ALL chocolate- not just the bars or pieces, I give up chocolate flavored goodies too. No chocolate ice cream or ice cream with chocolate bits (which let’s face it are the only types worth eating). No hot chocolate or chocolate liquors. Not even chocolate shavings on a cappuccino. So on the eve of this great loss, I had almost all of the chocolate type things listed above (demonstrating why Mardi Gras is so justly called such), and I tried a new chocolate product that we brought back from Nicaragua- Pinolillo. It is a cornmeal based drink, which is super popular among Nicaraguans- so much so that they apparently call themselves "pinoleros" (though I can't claim to have heard this firsthand). It comes in different flavors, but I bought the chocolate kind as, I read, foreigners do not tend to have a taste for it at first sip. This, it turns out, is true, and I realized that it is perhaps the one chocolate product I will not miss in the next 40 days. So I moved back to Baltimore, and apparently I chose a lucky day to do so. I happened to return to the East Coast on Monday, in the very small window between historic, record-breaking blizzards, lovingly called Snowmaggedon or Snowpocalypse. The first blizzard that hit the east coast bathed Baltimore in 24 inches of whiteness. Three days later, 12 hours after my return, wave two came in almost as strong, and Baltimore got another estimated 20 inches to add to the original chaos. Baltimore has had 72.3 inches of snow so far this winter (breaking the '95-'96 record of 62.5). About 40 these inches fell within the span of 5 days. As a measure of comparison, I am a mere 62 inches in height. After the snow plows came through to clear the streets, there were many snowdrifts taller than me. Witnessing (and shoveling) Snowmaggedon the sequel was experience enough to count this phenomenon as my new thing of Tuesday. However, it also meant that our cars were entombed and that virtually everything shut down for the next week; so, I had to get creative for new things to do in the coming days. Surprisingly, I found that snow days, even at 31, can offer fun times. Day 14: Pretending that I grew up in Alaska instead of Baltimore. Day 15: Making Snow Angels (as an adult)! And not just any snowshoeing, old school snowshoeing- neither of which I had ever tried before. I have never felt more Canadian. They are calling for more snow tonight- maybe even up to 6 more inches. Che sarà, sarà... besides I have yet to make a proper snowman. For the 5 days after my trip, I had a partner in crime for my pocket project. C, a good friend of mine, came to Chicago to provide me with company and moral support for my upteen-th move. Not generally known for trying new things, she was not only up for the adventure, she partook in all of the variety of random experiences I suggested. She flew into Milwaukee on Thursday night, escaping the first Snowmaggedon on the East Coast. On the 1 hour drive from Milwaukee to Chicago, I spotted an A&W drive-in (not drive-thru), just like in the olden days. Since I have an unfounded nostalgia and displaced attachment to “how America was,” I loved uncovering lasting evidence of that time period. It was quite a proper drive-in (according to movies I have seen) with spots to pull into next to a menu, and trays that could be installed on the windows. It being 15 degrees, this option did not quite apply. However, we pressed a button for service, ordered an A&W freeze (a float just blended) and cheese curds (as an homage to the state we were in, Wisconsin) and the order was brought to our car by a friendly waitress (sadly, she was not on roller-skates). C gets more props for this one than I do. As I have mentioned, I am not shy with trying new (vegetarian) food. In fact, I make it a habit. However, C does not. Her food choices are generally all-American in style and usually involve one of three ingredients: cheese, pasta and identifiable meat. So when we went into the Water Tower place and saw Wow Bao, I had no idea that she would be game for these “hot Asian buns,” as their slogan boasts. In fact, we both got Edamame buns and she got a BBQ chicken one. The best was definitely saved for last though because the Chocolate bun was amazing! C's palate just broadened its horizons! Now I am no stranger to Salsa dancing experiences. In fact, we had a small (very small) contingent of salsa dancers when I was in college that never shied away from a night of dancing be it classes at a gym through Boomie temple or an outwardly shady basement club called Tapas, situated (oddly enough) in Baltimore’s Greektown. Yet, I had never been salsa dancing in Chicago, and because I have not been salsa dancing in so long, I had declared myself a born-again newbie. 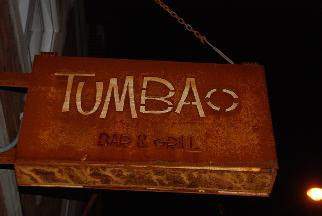 Our experience at Tumbao, a small, surprisingly elegant, venue in Logan’s Square Chicago, reminded us of all the highs and lows of a night of Latin dancing. Watching Competitive level dancers- high! Seeing their skirts creep up to the no-longer-a-skirt level- low. Listening to fun unknown (to us) merengues, salsas and bachatas- high! Listening to weird 80’s style pop and being urged to dance to this by the head of club security- low. Having a skilled dancer ask you to dance and lead in a way that makes you feel like a natural- high! Dancing with an hyperactive, arguably bi-polar spaz who gives you whiplash- low. Overall, it was a great night. Though it ended in the apparently classic way of most of our salsa nights: the scales tipped in favor of the “lows” and we knew it was time to leave. I wouldn’t normally classify a book shop as a new experience, but this one was: Bookman’s Alley in Evanston. It was like stepping into your grandfather’s library if your grandmother let him expand his book and antique collection to engulf the entire house. It was about four full sized rooms, with wall to wall shelves of books, antiques and memorabilia. Leather and flowery upholstered chairs were scattered throughout the space to allow visitors to collapse in with a rare find. All the books are used or gently-used, many of them are rare and quite a few are very valuable. The 80 year-old owner has run the shop for 30 years and had a bowl of gumdrops set out for his costumers… It made me miss my grandpa. Another 12+ hour car ride from Chicago to Baltimore. The rest stops didn’t offer too many wild adventures, but I found a new combination of chocolate and mint- my favorite combo ever! The candy bar did not disappoint. I have been struggling with how to faithfully describe my trip to Nicaragua. I loved my time there, but more than that I was grateful for the chance to open my eyes to a different part of the world. I had never been to Central America before; yet, while it was entirely new, it resonated with some part of me, making it feel strangely familiar. The longer I stayed, the more I became enamored of the place and people and the more it felt familiar. I learned that Nicaragua was a place to look beyond the surface. This country places before you the challenge of not judging a book by its cover. I often had to catch myself from doing so. I won’t deny that I was a bit daunted by this trip. I knew very little of Nicaragua and what I did know was its legacy and not its present day. My nascent Spanish had been all but engulfed by my recent years in Italy, and I had never been to a country whose poverty is quite as widespread. I wasn’t sure how comfortable I would be in the role of a tourist among this hardship. My first day in Nicaragua didn’t assuage this apprehension. I had heard more than once that Managua was not really worth spending time on, but my stubborn nature kept me from heeding this advice. I thought it a shame to fly into a country’s capital and not give it at least 24 hours of our time. In the end, I don’t regret this decision; however, I have a better understanding of why this advice was given. In the metaphor of not judging a book by its cover, Managua is definitely the cover, and it was very hard to look beyond it at first. Our first drive through the city took us into very heavy traffic, making the 90 degree dusty and thick air sit on your skin while the car was at a standstill. People walked up and down the lanes of traffic with bags of dried and fresh fruit, sacks of water and random trinkets like height charts and cell phone chargers, trying to take advantage of the down time and sell these goods to the people in cars. You could tell that this was their living and that what they made from these sales did not offer much of an income. We also passed many neighborhoods that sadly looked like the stereotypical images that humanitarian organizations take of the poor nations in which they work: neighborhoods where the houses are shacks spackled together with metal and wood bits, dirt roads, trash scattered over the ground and unkempt children and even families sitting around idly. Upkeep was just not a financial possibility. Trash littered many streets and countrysides. Stray dogs, goats and horses were all very slim if not bony. Main streets, though paved, were often rough and holey. Buildings were often dilapidated or vacant. Even the city’s main churches often looked neglected and in disrepair. Managua seemed a city not only unfamiliar tourism, but also one that had even taught its own people not to congregate or socialize in public. The major plazas of the city and even the major sites (the cathedrals, national palace and port) seemed completely evacuated except for the odd person or two (usually men) overseeing the food stalls or sitting in groups at the periphery of a park or city wall. All the locals we met running our hotel, even both of our cabs drivers, repeatedly uttered ciudado when we mentioned our intentions of going “sightseeing” to these major sites. The moment we stepped out of the cab, I felt that walking around to visit the sites was not the way it was done in Managua, and we would do better seeing these from a cab. 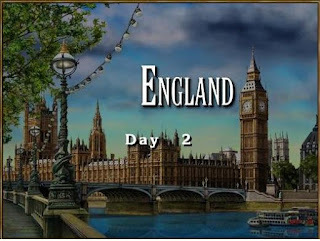 Yet, from the people we met, we could already tell that this country had more than appeared on first glance. The Nicaraguans were very kind, polite and helpful. They were also noticeably reserved, widely respectful and appreciative of our business and tips. They were very patient with my fr-italo-span-glish, which I appreciated a great deal. They gave us advice about where and how to go places, e.g. taking buses versus cabs. They were happy to help us get a taxi and even walk us to an ATM machine. They always greeted and sent us off with a smile. The people we met in the following days in Granada confirmed these impressions. I found that they were hard working and looked for opportunities to earn a living, but respectful of your privacy and wishes if you declined their offer of live music, fresh fruit, cab rides or other sales. Going deeper into the country was like going deeper into the book and arriving in Granada the next day uncovered more of Nicaragua’s beauty and intrigue. Granada is known for its colonial style with its Spanish tiled roofs and interior courtyards. Its buildings are brightly colored from sunshine yellow and robin’s egg blue to muted lavender and warm fuchsia. The city has four regal cathedrals whose domes sit on the horizon. These cupolas are only second to the skyline’s most impressive view, the Mombacho volcano. Now dormant, this volcano accounts for much of the nature in the region and for the 360 isletas in Lake Nicaragua, on the banks of which Granada sits. With great fortune, we had managed to reserve one of the two rooms in the most perfect bed and breakfast I have ever stayed in. The web site alone was enough to sell me on the place (http://www.missmargrits.com/). However, the computer images can’t even begin to do justice to this jewel. It is run by a lovely, young British couple who were friendly, interesting, attentive and generally charming in every way. We soon befriended them and shared evenings of great conversation over liters of Toña (the local brew). We also shared a funny outing to the circus, a completely unique experience! This guesthouse was impeccably furnished and peacefully elegant. The rooms were gracefully minimalist with beautifully carved wooden doors and an impressive head board. The white walls and white sheets were punctuated with fuchsia Tillandsia flowers that welcomed you into the room. We woke up every morning to fresh juice of melons, oranges and bananas, coconut bread and real fruit jam served at the table adjacent to the courtyard garden.The outdoor green tiled kitchen, the deep blue walls, turquoise swimming pool and the two interior courtyards really gave you a taste of a tropical paradise. As the cherry on top, the questhouse even had an exuberant kitten that used the inner courtyard as her personal jungle, crouching behind plants and tree trunks to hunt bugs and the occasional gecko or bat. Life was made to be outdoors here. 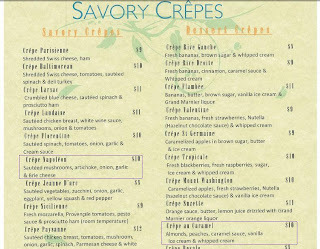 The markets, the court yards, the hammocks, the outdoor restaurant seating… you had to be in touch with the weather and seasons. Of course, we were there during dry season, and I am sure that amendments need to be made during the wet one. Yet, with courtyards constructed into houses, life seemed built for being outside. You learned to live with the temperature- when you get hot, you go in the shade or get a rifresco- when it cools down at night, you sit outside to enjoy the breeze. Obviously, we could be nothing but tourists there. So I can’t pretend to say I know what life is like in Granada as a local or even an expat. But there was a familiarity to this way of living. We filled our days exploring the city streets, trying out the local cuisine, and cooling down with fruit smoothies or cold cocktails. We visited the four cathedrals, two of which I mistakenly assumed were closed because of their rundown façades. In fact, these two churches, Iglesia de Guadeloupe and Iglesia de la Merced, were both fully functional and were lovely inside (at least de la Merced, we never went into the other). This mistake precisely demonstrated to me that taking the façade as an indicator of its interior was wrong. In reality, the exterior did not at all reflect what was found inside, and this was a truth we found evident of many places in Granada. The façade very rarely lured you in. In fact, it might even deter you. You had to trust the recommendations from locals to walk into an otherwise shabby or non-descript exterior to discover the greatness inside. Unlike North America or Europe, the effort didn’t seem to go into the outside or marketing of an establishment. There were virtually no big signs or fancy doors to cafes, hotels or restaurants. The paint was not always perfect; the windows not always clean, but the inside was often impeccable. All the care went on the interior: beautiful wooden floors and walls, thatched roofs, amazingly lush and manicured interior courtyards and vividly painted walls with colors like royal peacock blue and soft purple. The flowers, plants and trees were often the best décor in a restaurant or hotel. It was easy to see the natural beauty in this country. It surrounded us from palm trees and tropical flowers to the volcanic lake (Laguna de Apoyo) and lush isletas; you couldn’t help but be impressed by what nature can do. In many ways, it felt like life in Nicaragua seemed to bring things back to the important basics: family as the raison d’etre, conversation as the primary source of entertainment, community as the support system, and religious beliefs at the foundation for everything. Nicaraguans seemed to have their priorities straight, and I, for one, admired this way of living. At the end of my trip, when I looked around Nicaragua, all I saw was the richness in their life. The litter, dirtiness and dearth of the exterior faded away into a deeper understanding of the place. I saw that the poverty did not extend beyond the facade. In the lack of focus on monetary worth, Nicaragua reminded me of what is really valuable. Since I had never been to Nicaragua before, my trip there certainly fits into the idea of trying something new each day. However, it would do injustice to my vacation and this beautiful country to only mention specific things like gallo pinto and guava cocktails. So this posting will be a teaser for a proper posting on my Nicaragua trip. It was about 6 hours of flying time to Managua from Chicago (3 to Miami and another 3 to Managua). So I had to find something new to do in the airport. Shockingly, I found this pretty entertaining: a "computer wall" where you could check the news, sports and weather (92 degrees farenheit, 33 degrees Celsius in Nicaragua). This rather haunting but gorgeous church was literally just a shell. Its frame is made of metal and, therefore, withstood the earthquake of 1972, but it has yet to be restored. I never did figure out what this was called, but I found it in the pastry section of a grocery store. It tasted like a combination of sugary-bread and cake. Quite good! Macua- "national drink" of Nicaragua (according to lonely planet) made of rum, guava and lemon juices. Yum! Fried plantains placed beneath a very salty block of cheese. The cheese tasted a bit too much like salt water for me, but nonetheless, I was quite happy with this vegetarian option (which are few and far between). Laguna de apoyo was created when a volcano imploded then filled with subterranean water and rain over 20,000 years, resulting in one of the freshest lakes in Nicaragua. Being introduced to the staple food of Nicaragua: Gallo Pinto (black beans and rice). I loved it! I have never been kayaking so this 3 1/2 hour tour of las isletas (small islands) just off the coast of Granada in Lake Nicaragua was a perfect first trip. We saw only a few of the 360 small-to-tiny islands, one of which is called La isla de los monos: Monkey Island! 8 spider and/or white-faced monkeys live here apparently thanks to an eccentric island owner who once had them as pets. Trying a type of local fish, corvina, and yuca- cassava root that tastes surprisingly like mashed potatoes. Like almost all the food we tried, it was fantastic! Yes, we did go to a circus, complete with contortionist, clowns, jugglers and a Michael Jackson impersonator (not traditionally incorporated in circuses from my youth, but a surprisingly good fit). We also witnessed a procession for San Bosco, lounged in hammocks at cafes, gawked at an intense red and pink sunset from a church bell tower, made the acquaintance of a cat named chicken and stayed in the loveliest guesthouse I have ever been to. But this is all for another day and another posting.